I have a poem in the latest and last issue of Pascalle Burton’s, Today, the voice you speak with may not be your own. 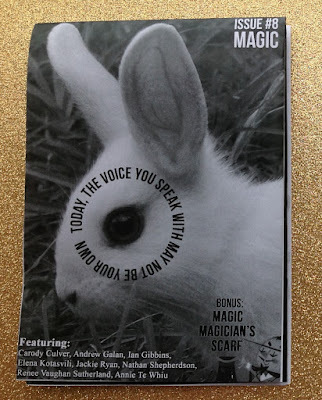 This is issue 8 and it also features the work of Carody Culver, Ian Gibbins, Elena Kotasvili, Jackie Ryan, Nathan Shepherdson, Renee Vaughan Sutherland and Anne-Marie Te Whiu. My piece is A transcript of the Dungeons & Dragons opening credits. I’ve included the video source below. The series was never concluded and so these six kids have been left trapped forever in the realm of Dungeons and Dragons.